An overview of Cubify Invent 3D modeling software. Cubify Invent by 3D Systems is a consumer computer-aid design (CAD) software designed to be an easy tool for 3D creation. You don’t need to be a professional CAD designer to create professional-looking 3D designs. 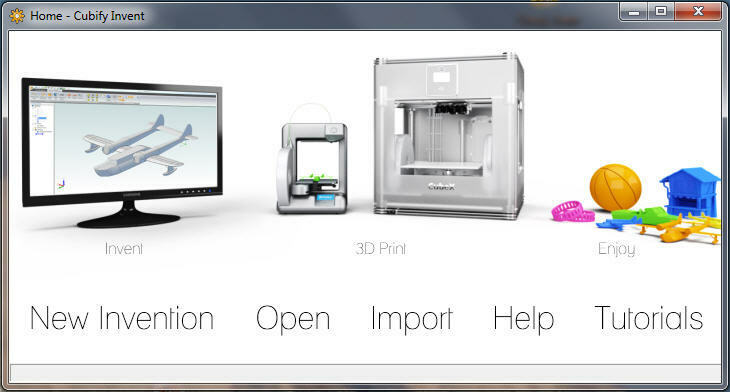 The software is designed with 3D printing in mind. Cubify Invent will export an STL file of your object that you can send to your home 3D printer or send to a 3D printing service to have printed. The user interface is fairly user-friendly but be prepared to spend some time navigating the software and learning to use the different tools. 3D Systems offers a number of training videos that will help you get the most out of Cubify Invent. Zoom – scroll your mouse wheel to zoom in an out. Pan – hold the middle mouse button down. Rotate – hold left and right mouse button down at the same time. History Tree – The History Tree is on the left side of the screen and is a timeline where you can see each step of developing your model. The blue DogBone shows what is currently being displayed. You can slide the DogBone up and down to review the steps taken to create your model. You can also double-click on the step to move the DogBone to that location. The History Tree makes it easy to go back in time and make changes to your model without undoing your entire model. Tool Bar – The toolbar is located across the top of the screen and has all of the tools needed to create, view, and measure your object. The toolbar has 3 main tabs: Part Modeling, View and Measure, and 2D Sketching. Be aware that the 2D Sketching tab is only available when the Activate 2D Sketch button is clicked. Part Modeling – Here you will find all of the tools to create a 3D object including Extrude, Fillet, Mirror, Loft and more. Viewing and Measurement – This tab contains all of the viewing and measuring tools. If you’re not using a computer with a mouse, this is where you can access Zoom, Pan and Rotate. Activate 2D Sketch – The Activate 2D Sketch button is located on the upper-left corner of the screen. Click this button to open the 2D Sketching tab. You have to have a face of your object or plane selected to activate 2D Sketch. Or, you can click Activate 2D Sketch and choose a plane or face to open the 2D Sketching tab. This is where you can draw your 2D shapes that you can then extrude to create 3D shapes. 2D Sketching – The 2D Sketching tab has all of the tools needed to create 2D shapes that can then be extruded to create 3D shapes. This is where you will begin to create your model. When you’re ready to extrude or modify your 2D shapes with other tools, click the Part Modeling tab. Click Deactivate Sketch to close the 2D Sketching tab. Icon Menu – The Icon Menu is located in the upper-left corner of the screen. Click the orange, star-like icon to open the menu. In this menu you will find: New Invention, Open Invention, Import, Save, Save As, and Export. Here you can begin a new invention, import an existing invention and export an SLT file. Undo/Redo – Located in the upper-right corner of the screen, the Undo/Redo tool allows you to undo and redo steps in your design. Using this tool will also move the DogBone in the History Tree so you can see where you’re at in the design process. Views – Along the top of the screen you will see a number of cubes with highlighted yellow squares. This allows you to view your object from many set perspectives including top, bottom, sides and more. Cubify Invent will help you turn your good ideas into real objects. The software is easy enough for the do-it-yourself 3D modeler and still has some comprehensive tools to help you create more complex objects. For more information, check out the Cubify Invent Website.